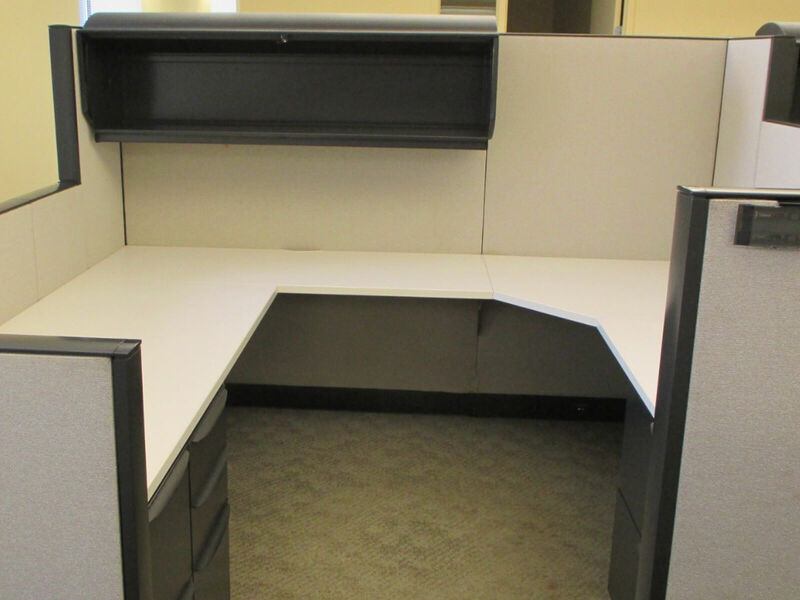 Used cubicle inventories move FAST- don't let it slip through your fingers! 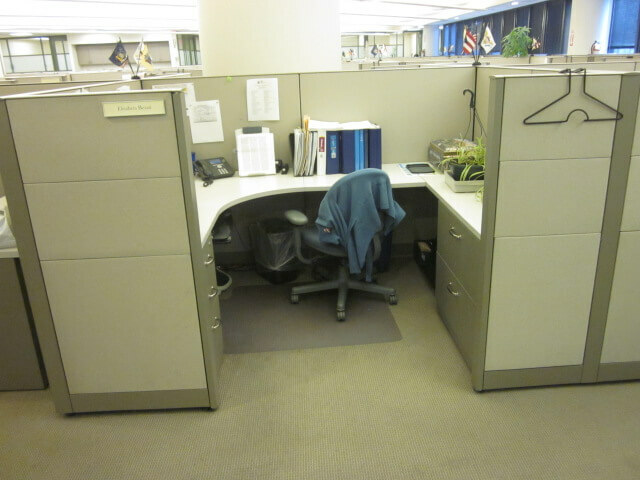 Used cubicles offer undeniable value to discerning buyers. 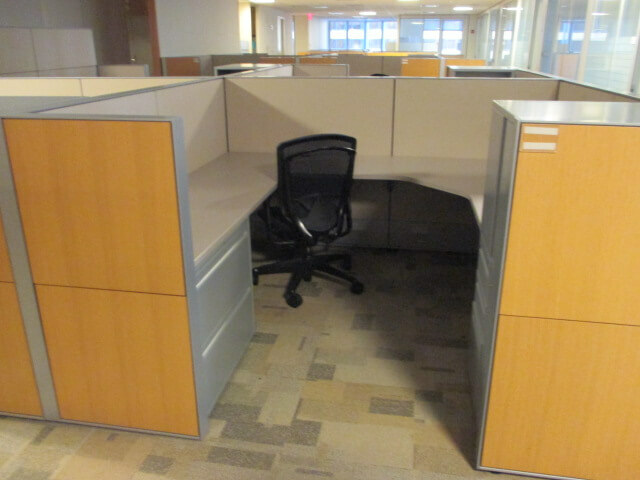 We have great discounts on top brands like Haworth, Herman Miller, Knoll, Steelcase & more. 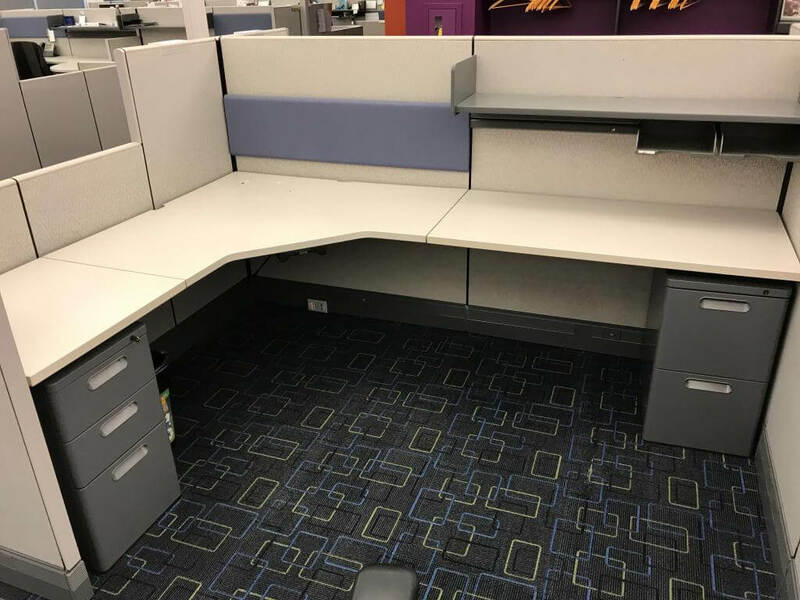 Who has the budget to buy them brand new at full price? 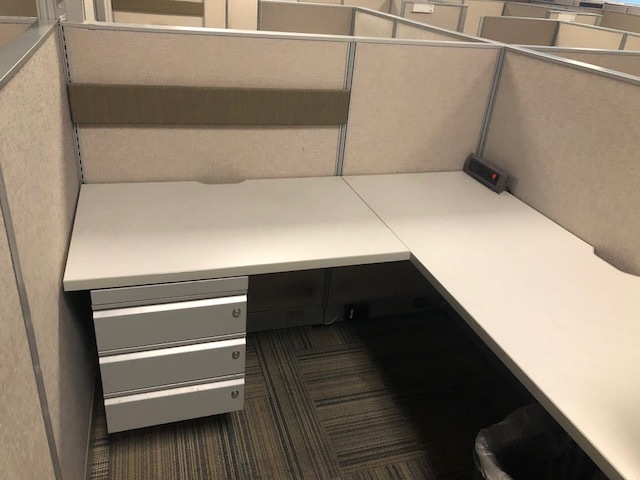 Not many! 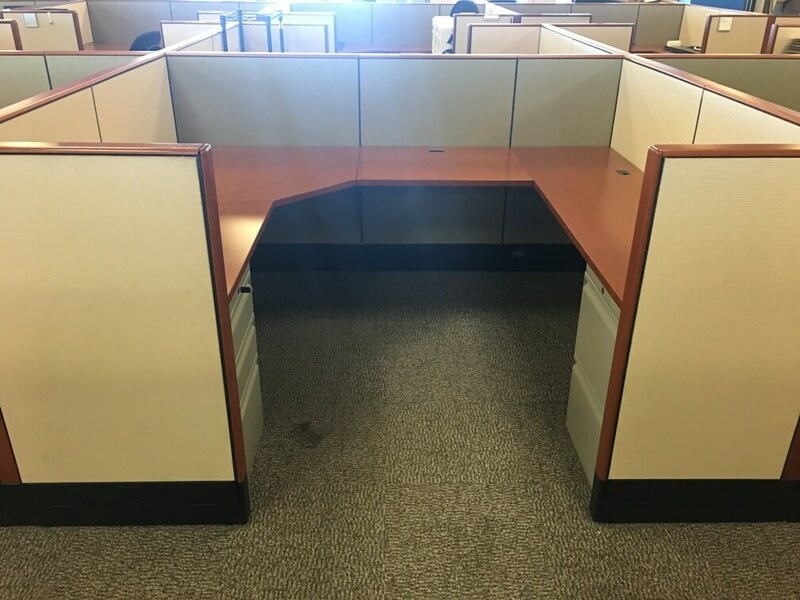 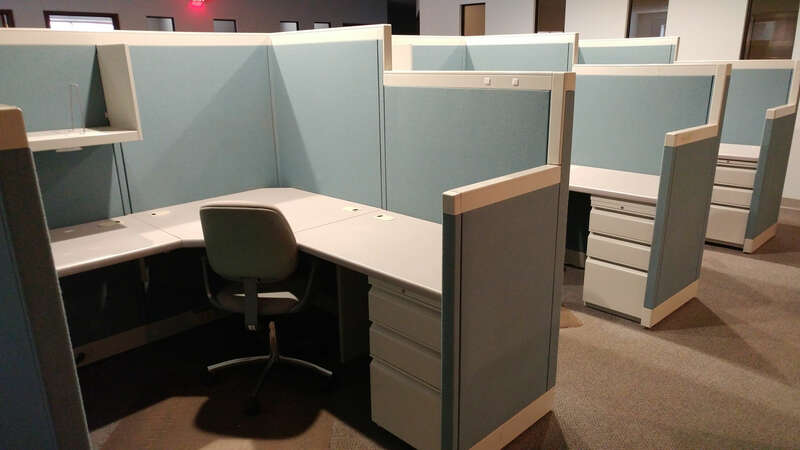 Luckily these brands are built to LAST – so if you buy used office cubicles from them you will save thousands of dollars on work stations with many years of life left to offer. 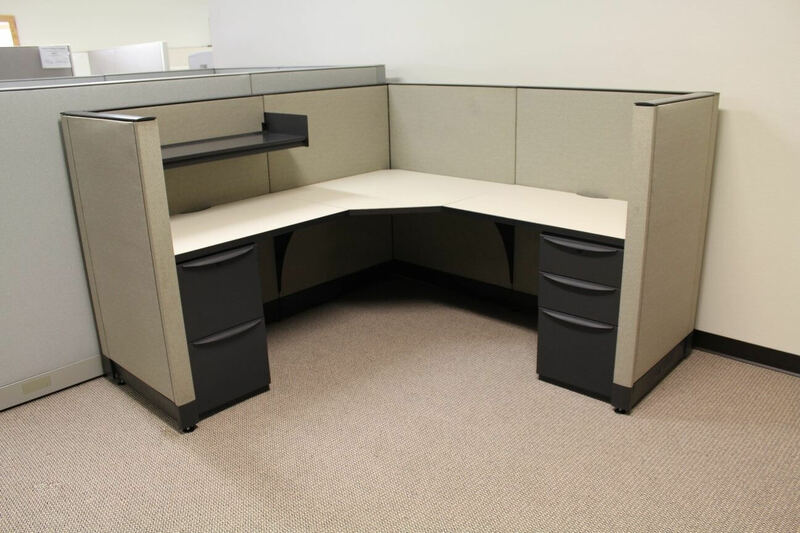 Browse this page for inventories with short, medium, tall, or combo panels, depending on the level of privacy you need. 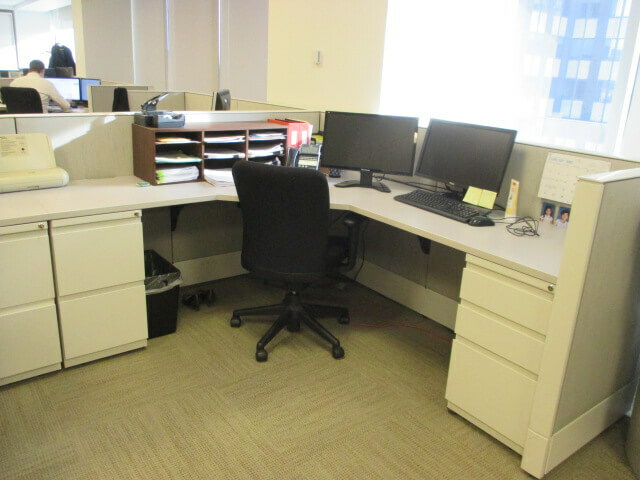 BE AWARE: Used inventories are subject to prior sale and can disappear quickly! 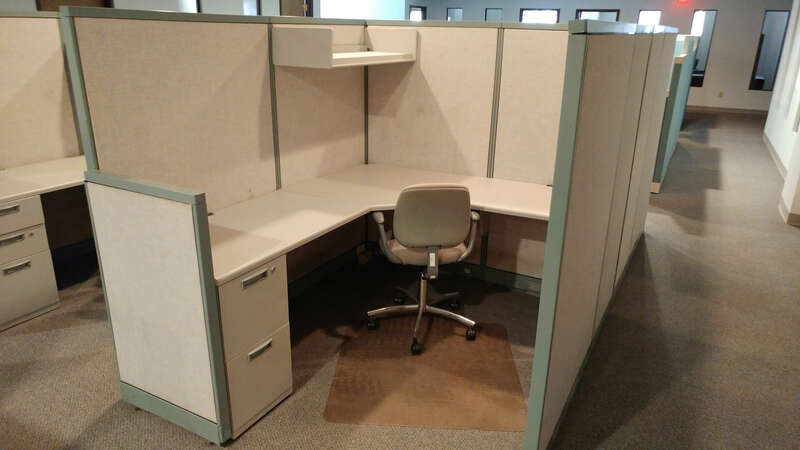 If you take pride in being pennywise, used cubicles for sale and used office furniture for sale from one of these big name brands can be a smarter business investment than buying brand new ones from a lesser known manufacturer that may not be as reliable or well built. 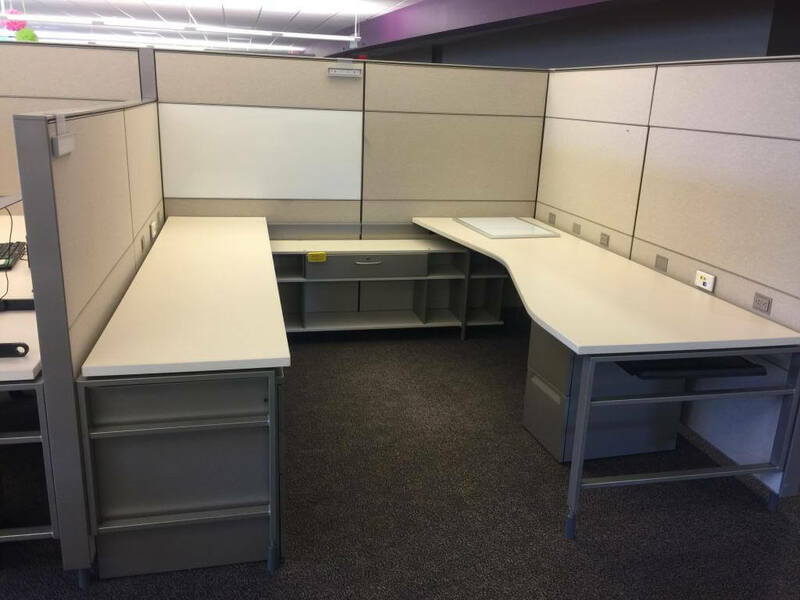 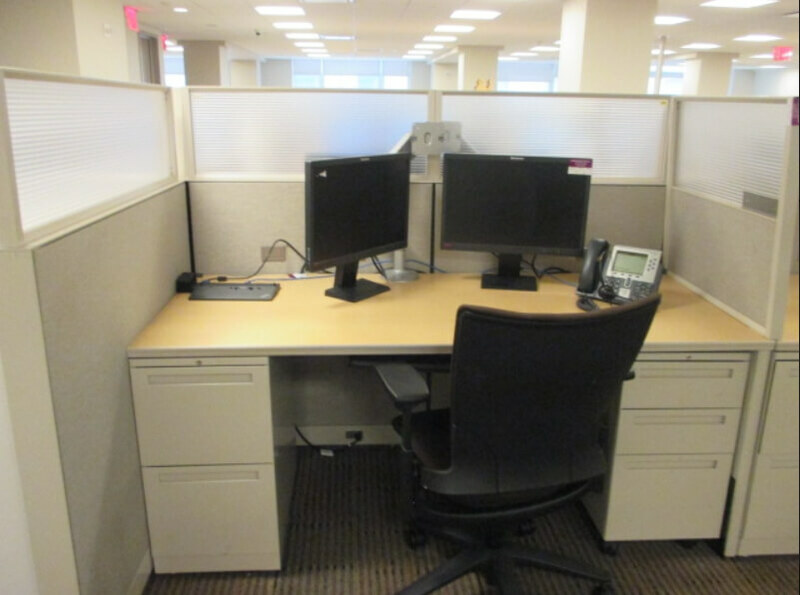 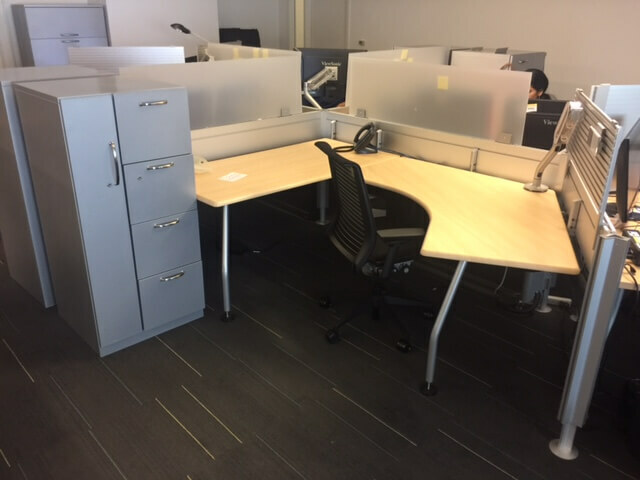 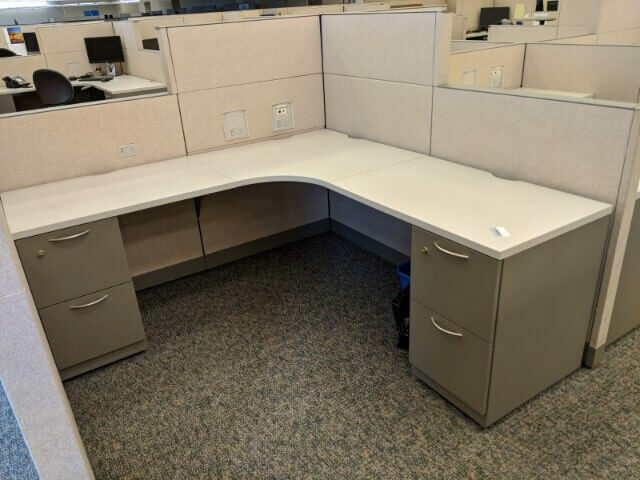 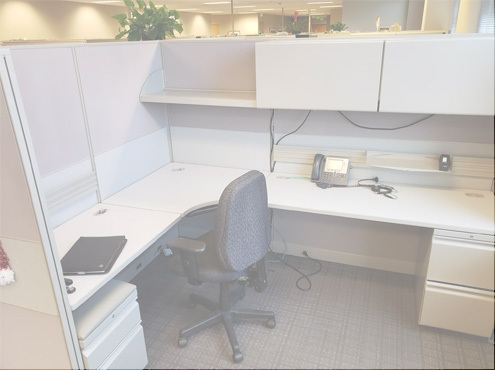 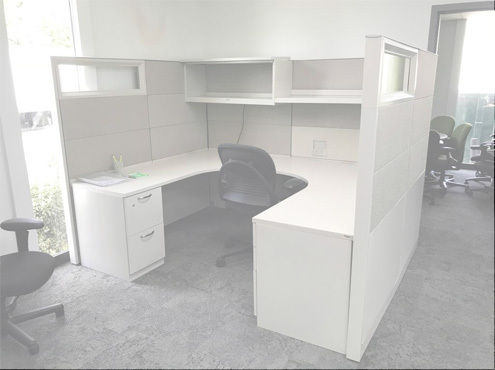 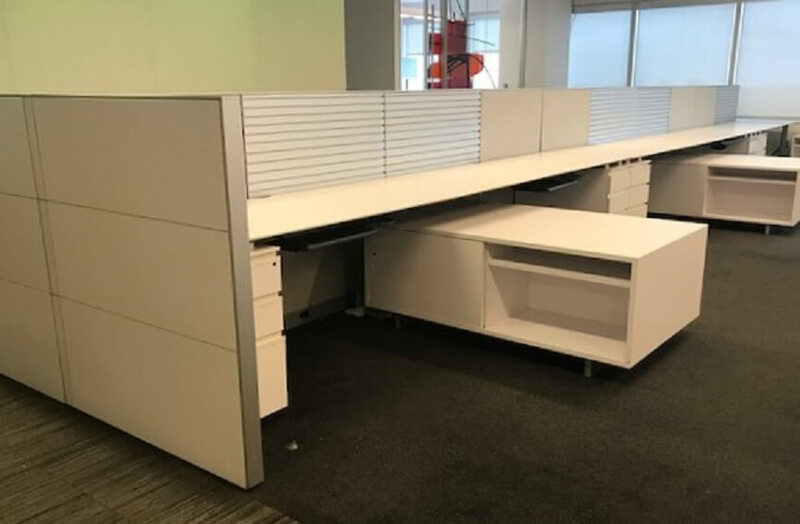 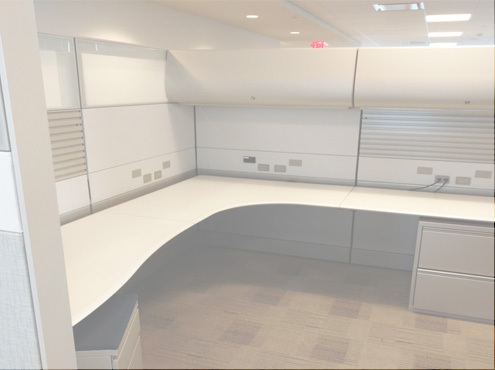 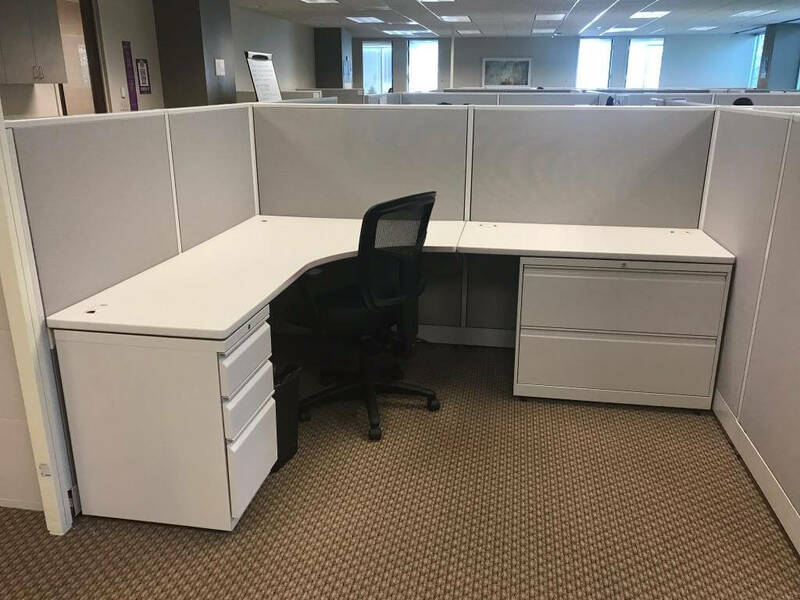 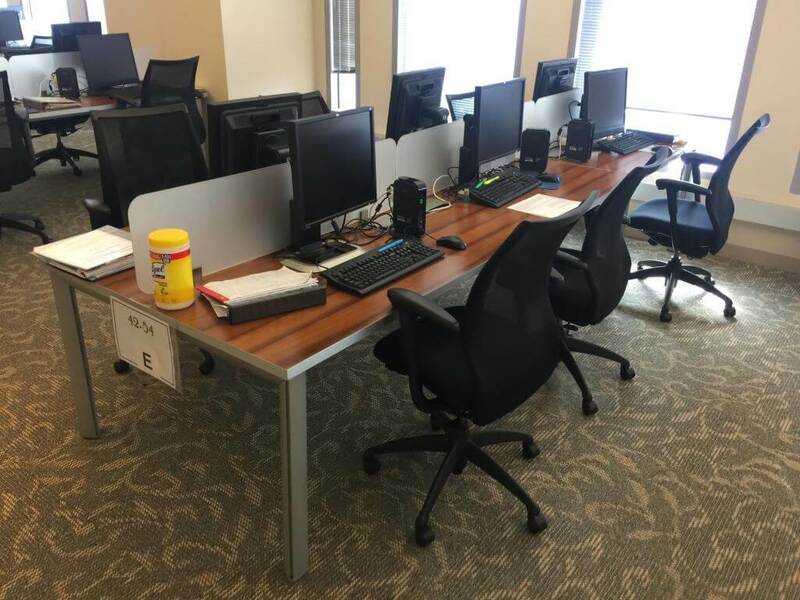 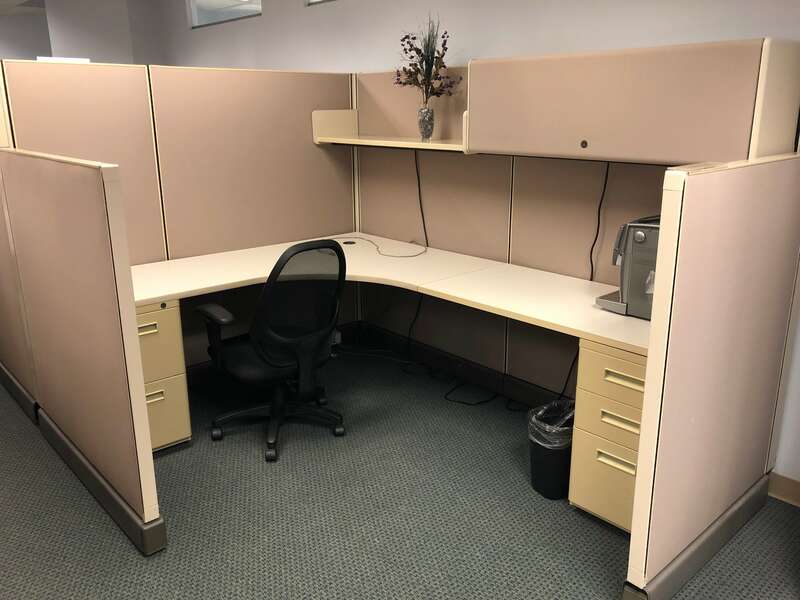 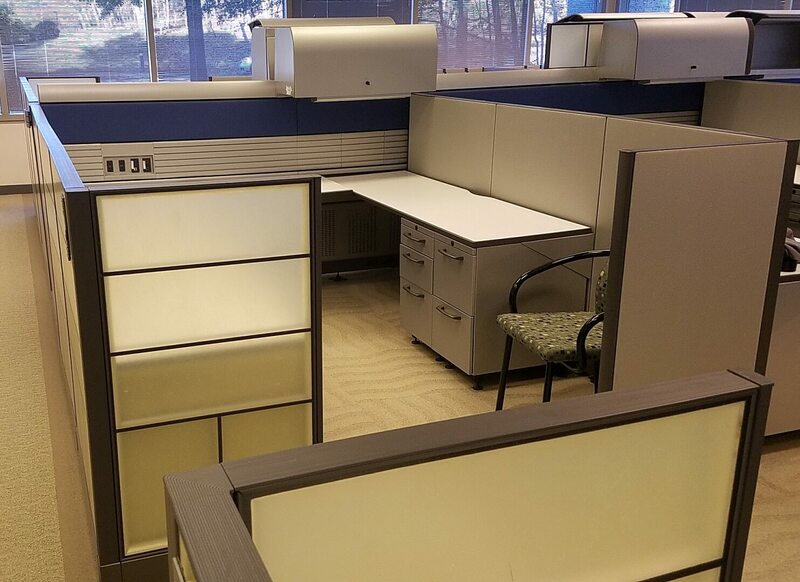 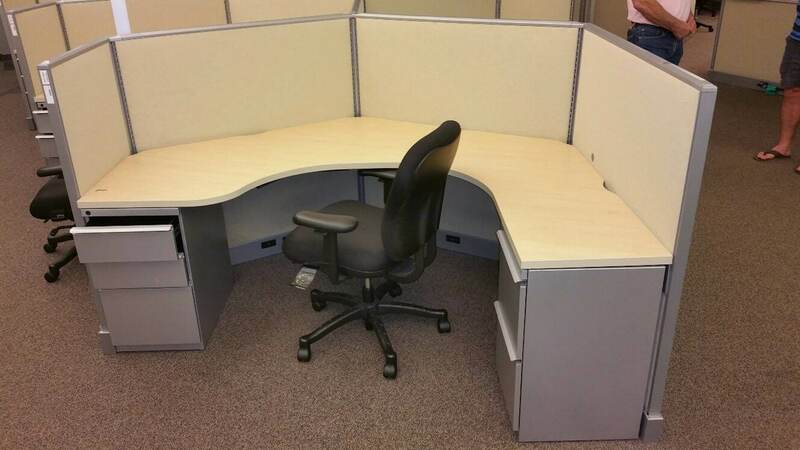 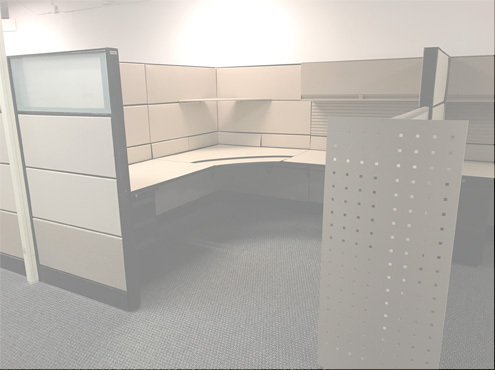 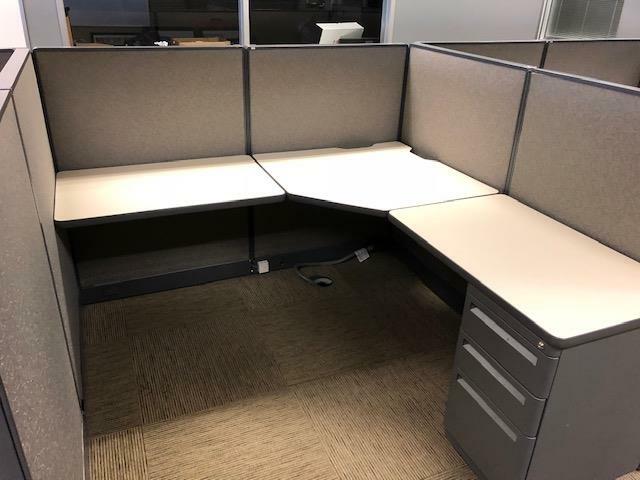 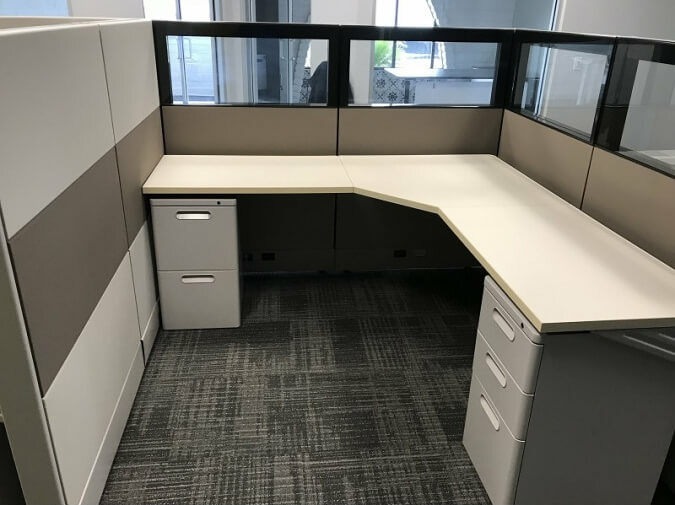 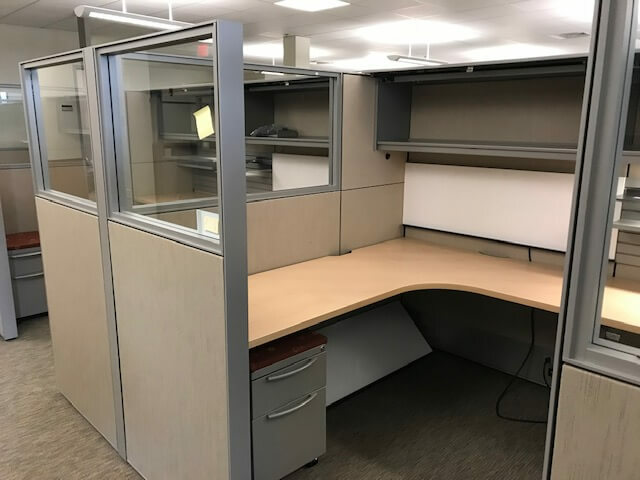 Gently used office workstations from Herman Miller (for example) may last you 10 years with available service for additional or replacement parts. 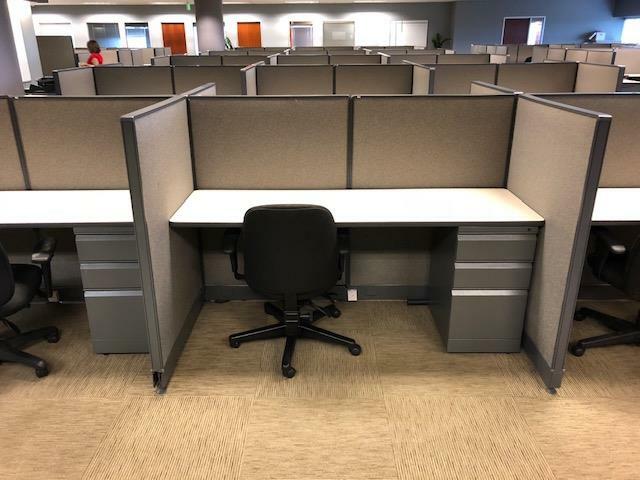 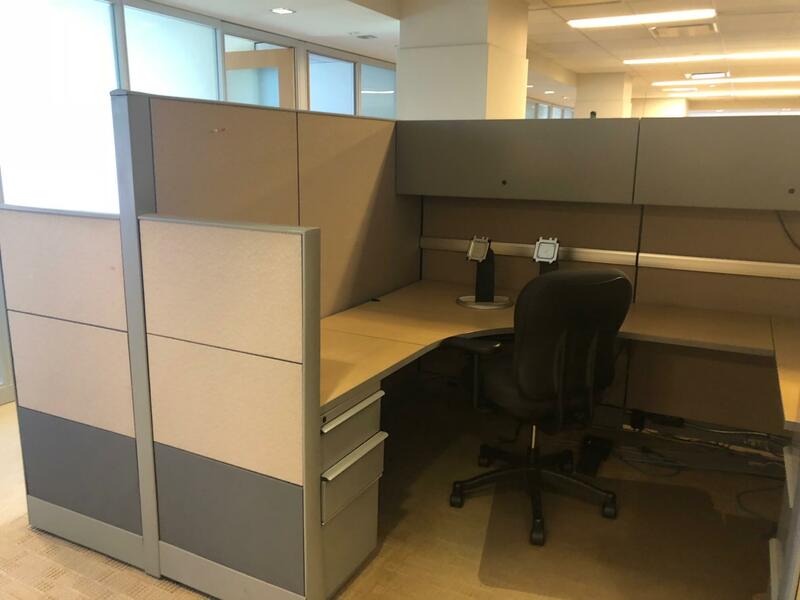 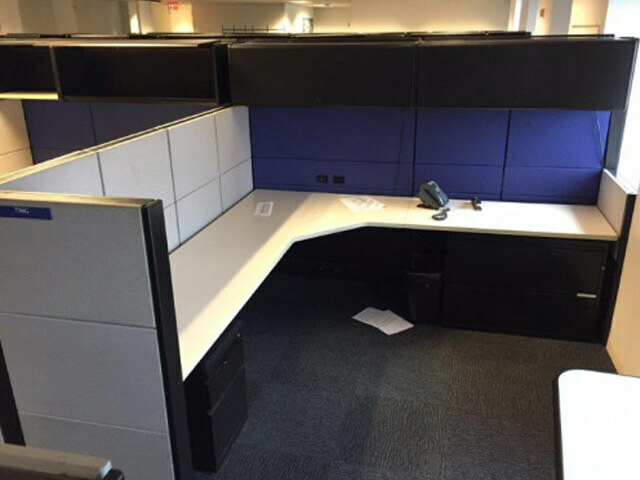 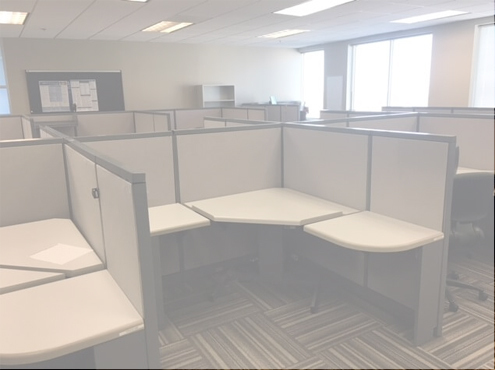 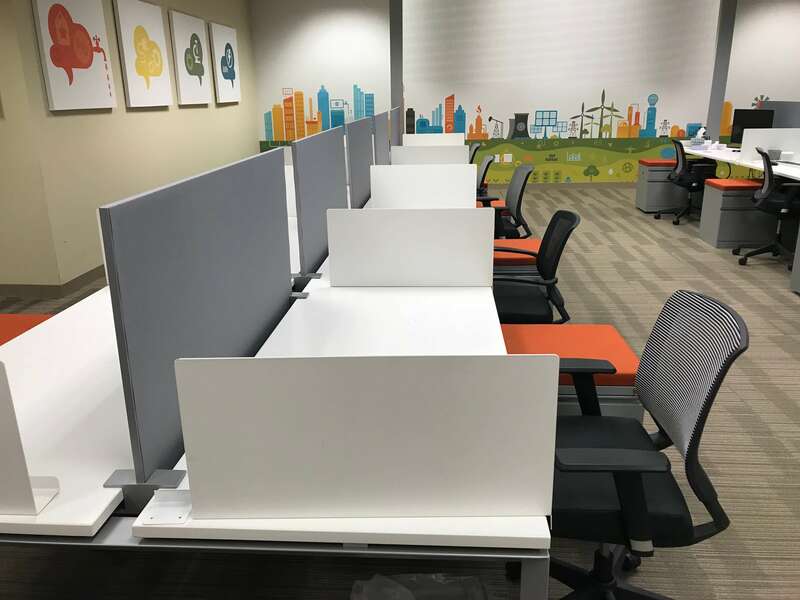 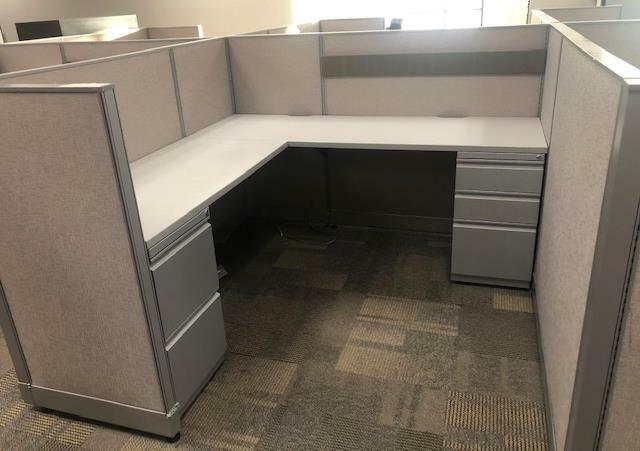 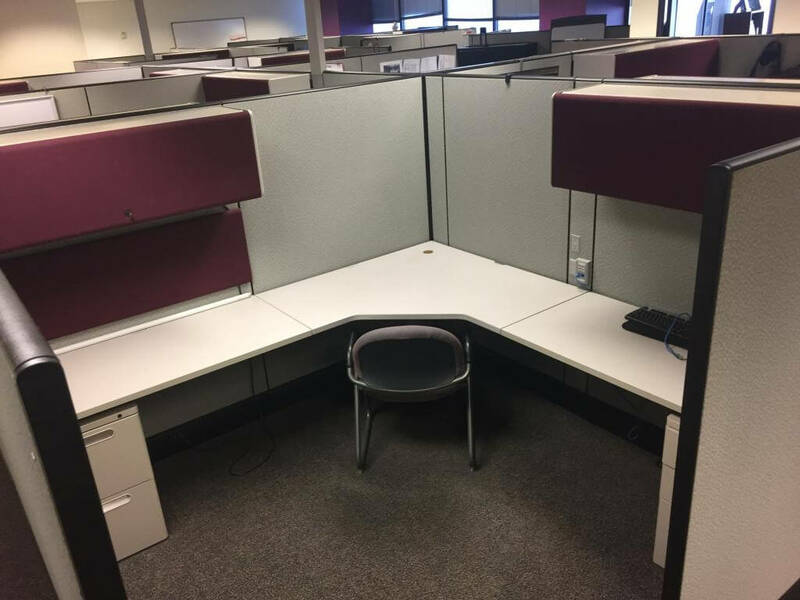 Meanwhile, brand new cubicles from “Crazy Eddie’s Cubes R Us” might last you a few years with no one available on the other end of the customer support line when you need them. 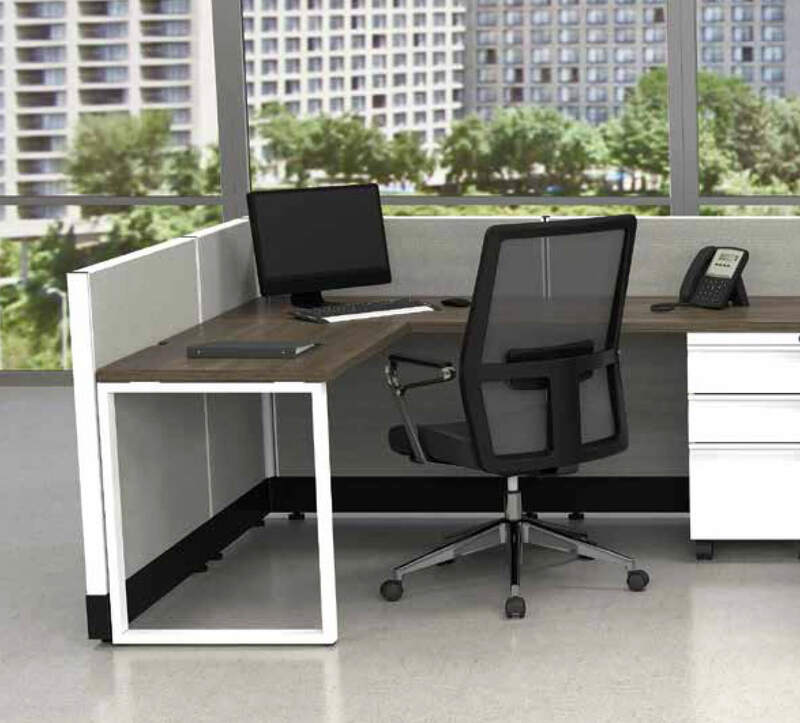 It’s important to know and trust your office furniture dealer! 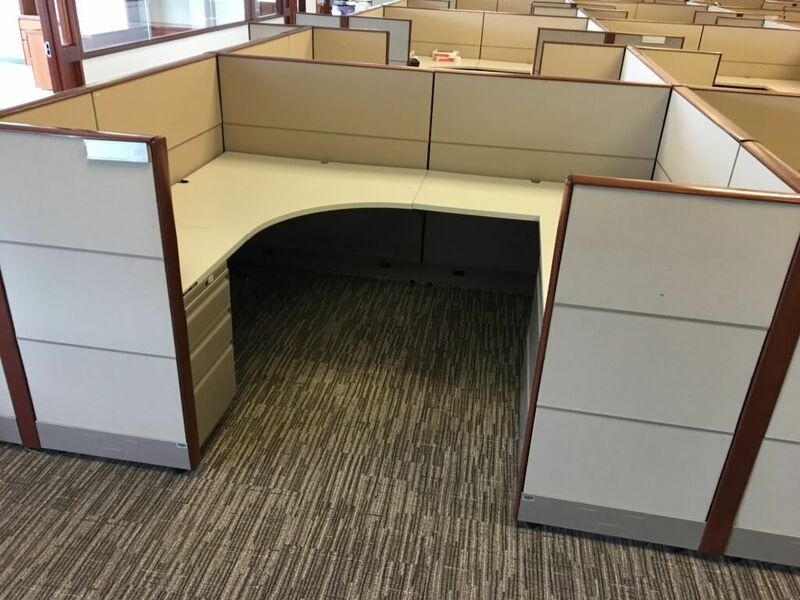 This is generally not a tremendous obstacle except for the exceptionally picky. 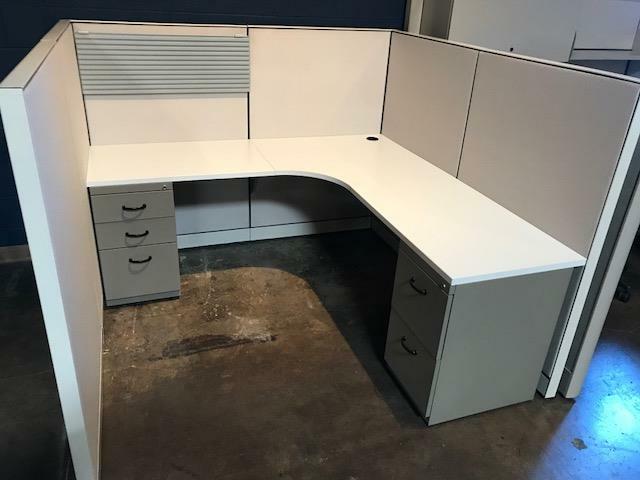 In any case, unusual colors are not usually carried by reputable preowned systems furniture providers, who prefer the customary beiges, blues, and grays. 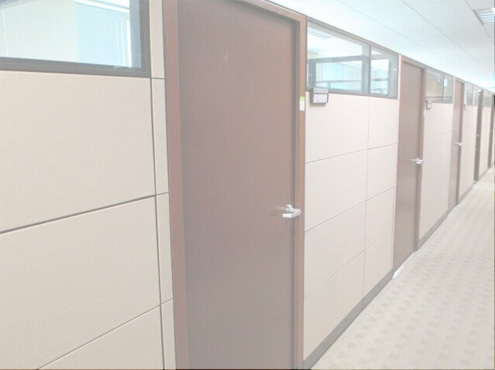 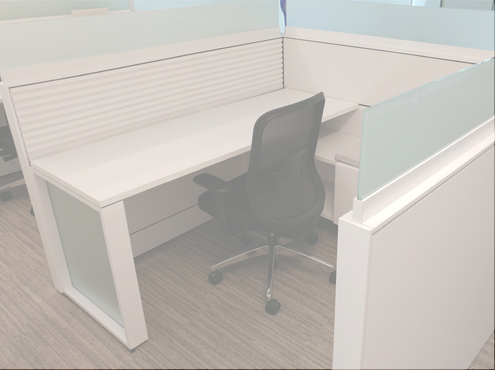 If your business demands are very specific, the available cubicles’ size and configuration can present an obstacle. 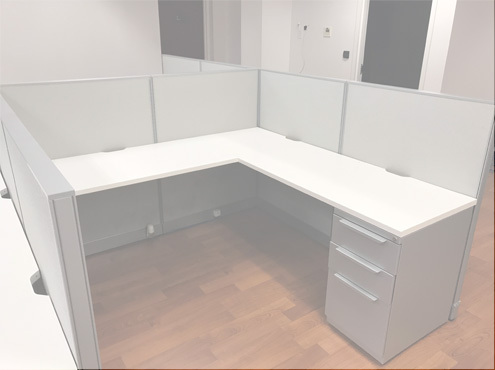 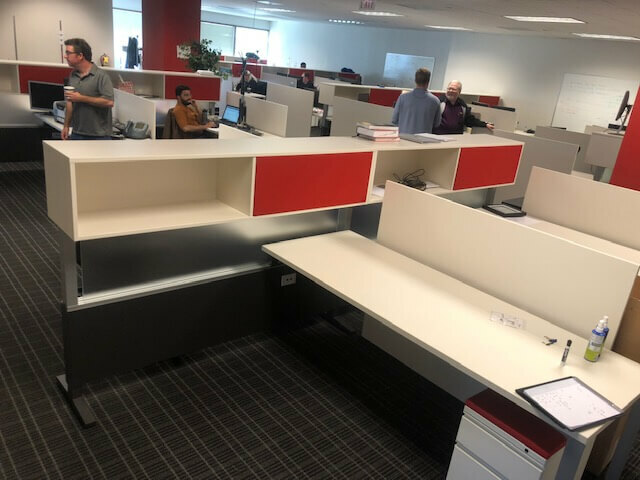 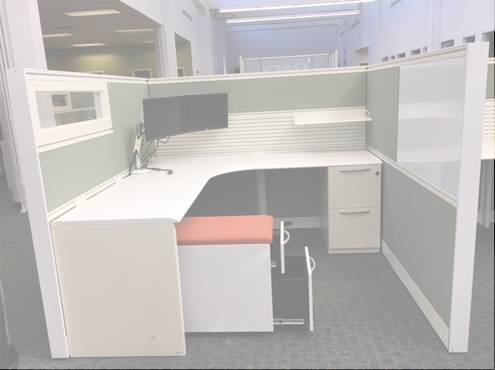 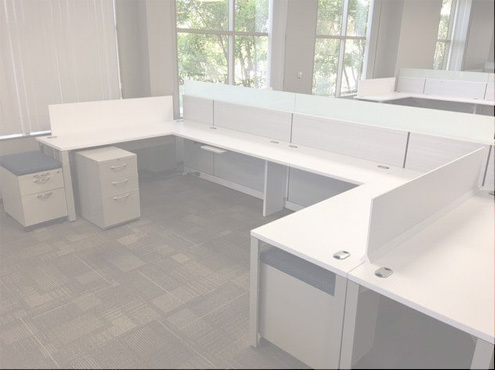 For instance, engineers or architects might require workstations with non-standard, extra-deep work surfaces, or a small office with limited dimensions might need a very specific custom layout built to fit into the space available. 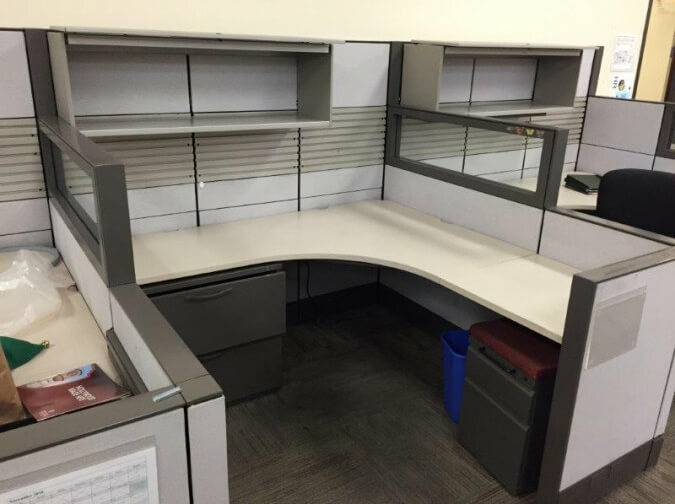 These types of situations are not likely to find what they want in an “As-Is” inventory. 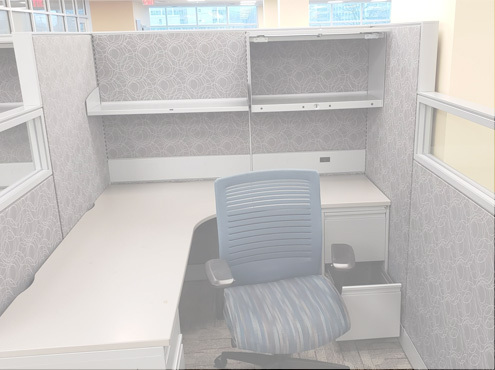 Not to mention, most used cubicle inventories have order minimums of 12 or more, so it’s not the best option for a business customer who only needs a few workstations. 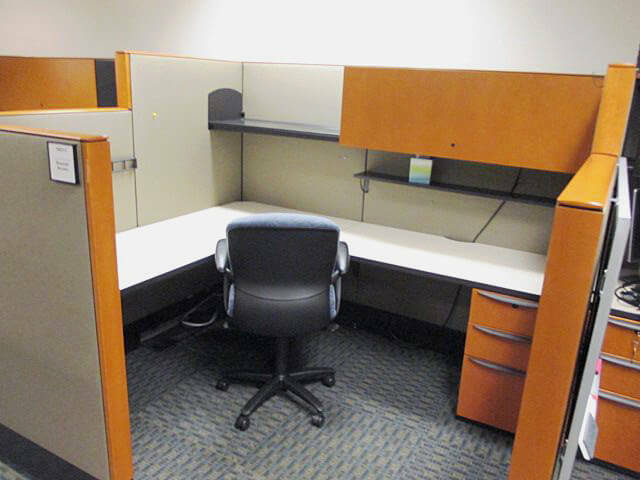 If you are only looking for a few stations, check out our Office In An Hour Cubicals with no order minimums! 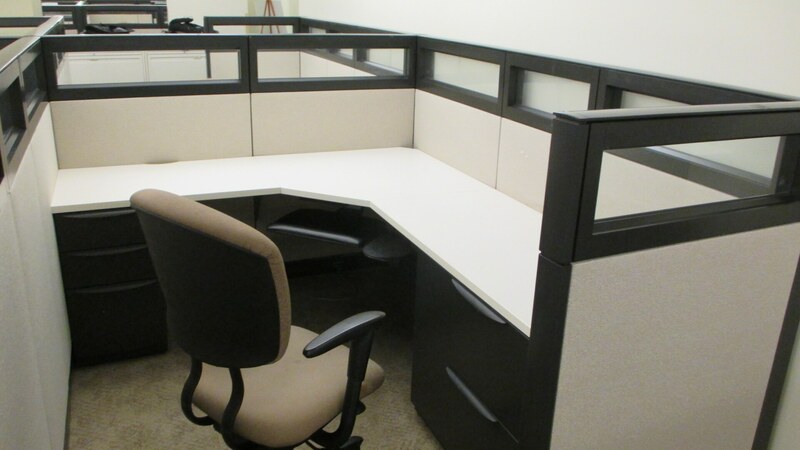 Distance can be an obstacle that adds time, cost and complexity to the order. 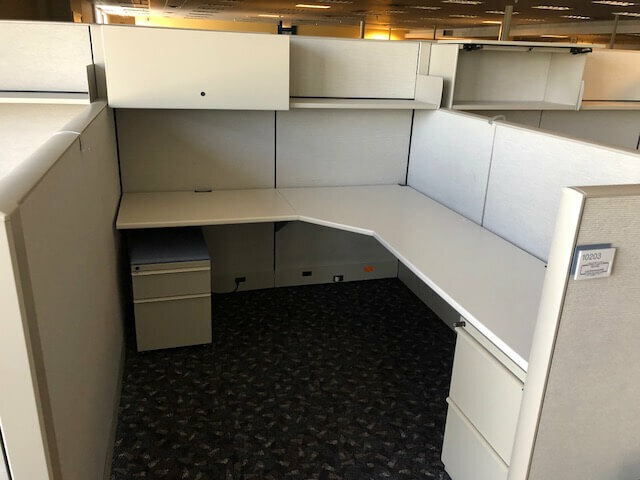 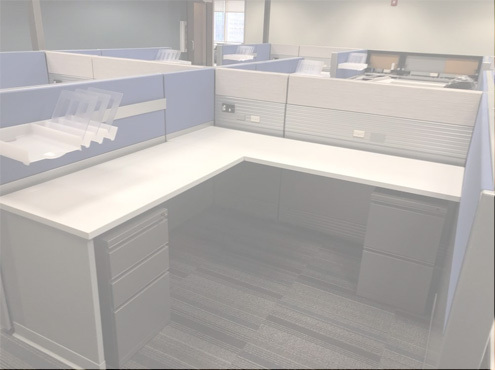 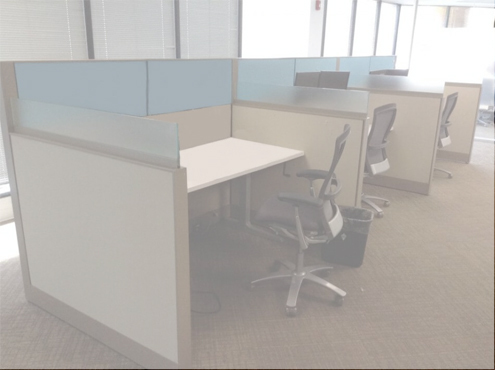 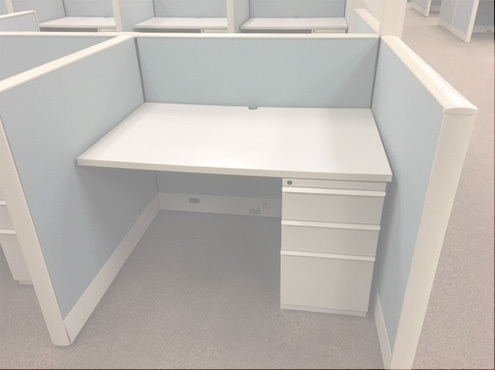 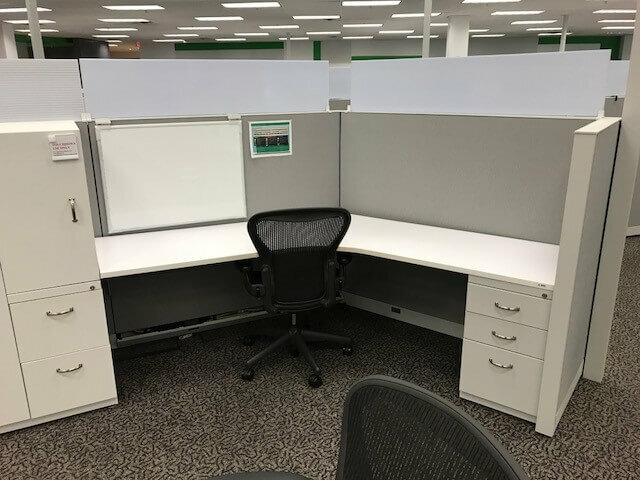 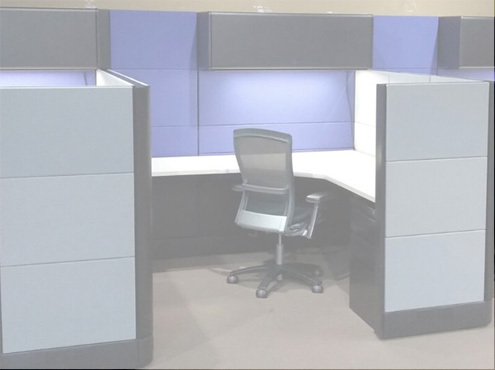 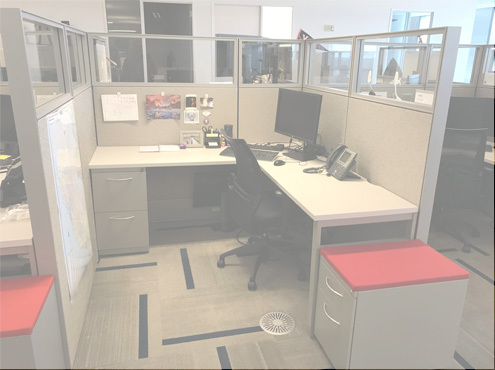 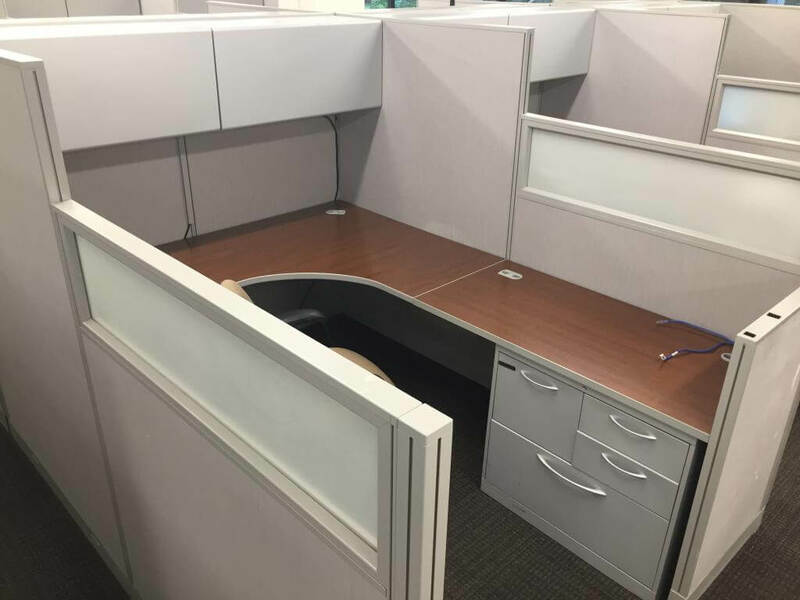 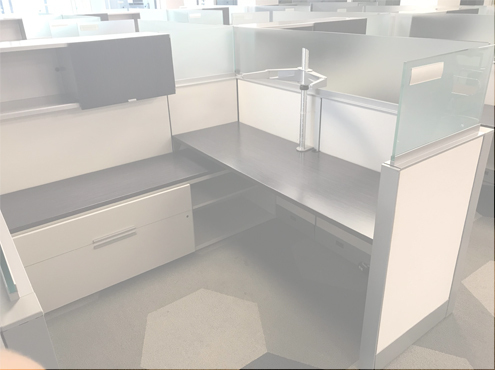 While brand new cubicle systems usually come with Free Shipping as a perk, used cubicles are sold “Where-Is”, meaning there are additional costs associated with getting them to you. 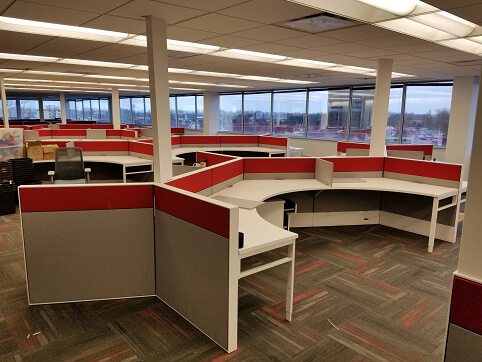 Your best bet is to find a used inventory within your region, since the shorter the distance, the lower the freight costs and the faster it can arrive to you. 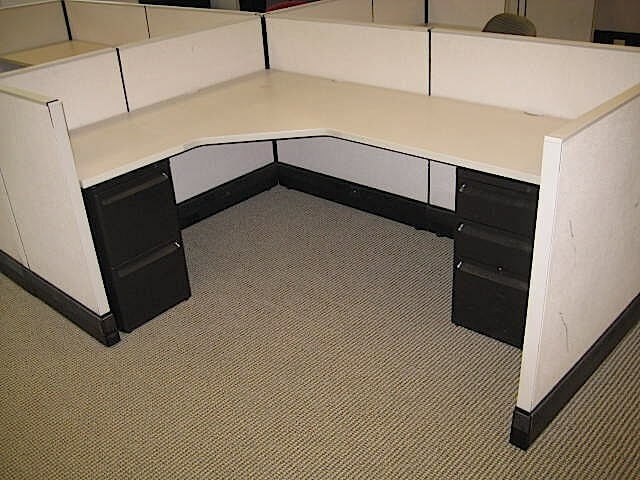 Even better, you can try to buy used furniture within an hour or two from your location. 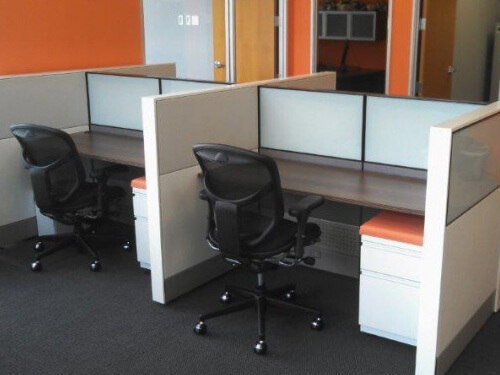 This often cuts out the need for palletizing and freight shipping, and can just be directly delivered and installed. 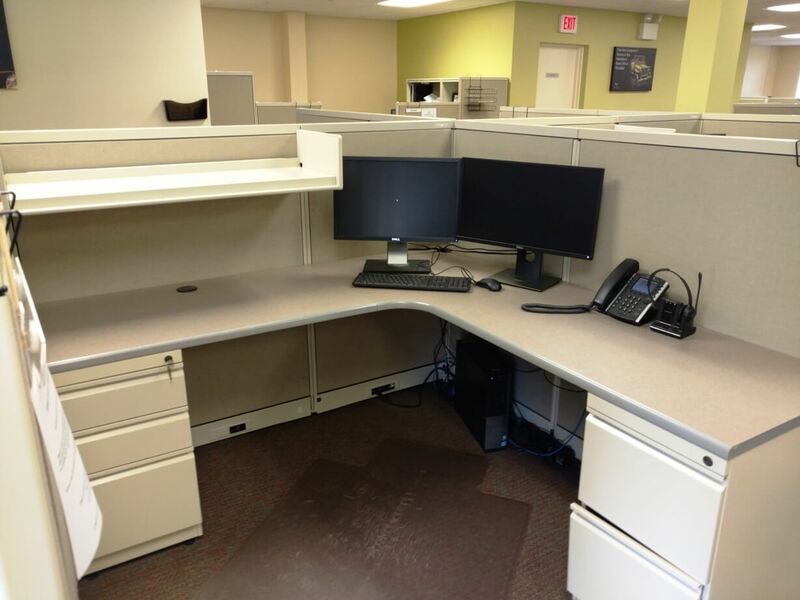 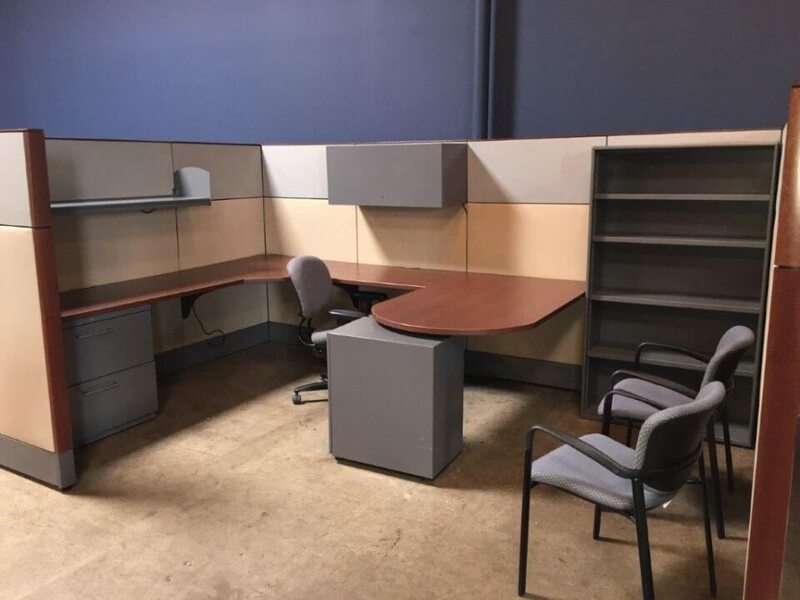 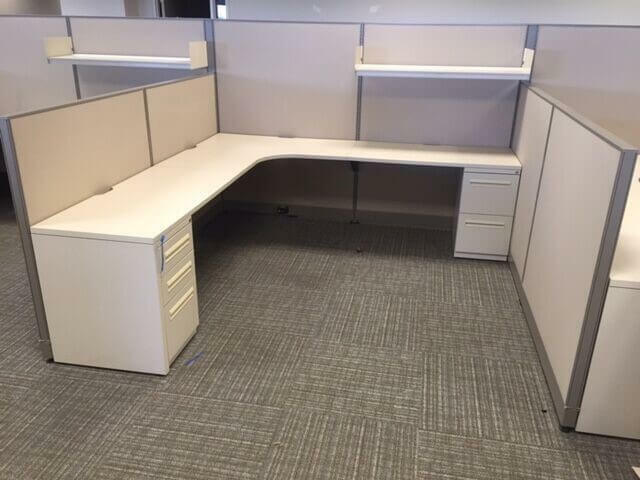 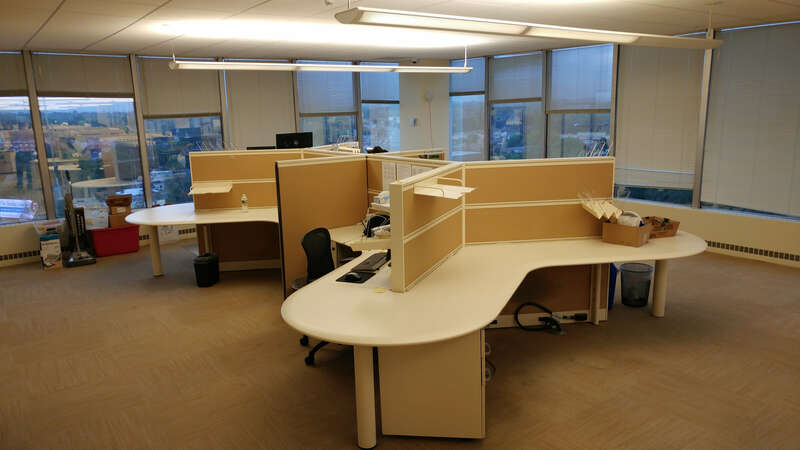 This page showcases used office inventories from all over the United States, or if you are in the NY/NJ/TriState area, you can also check out our sister site, Used Office Furniture NYC. 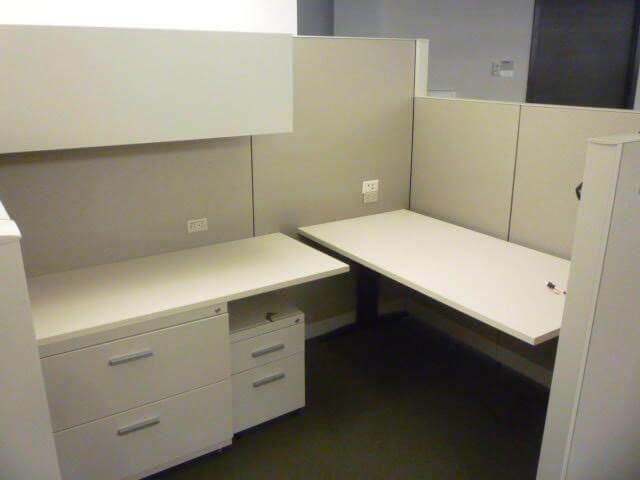 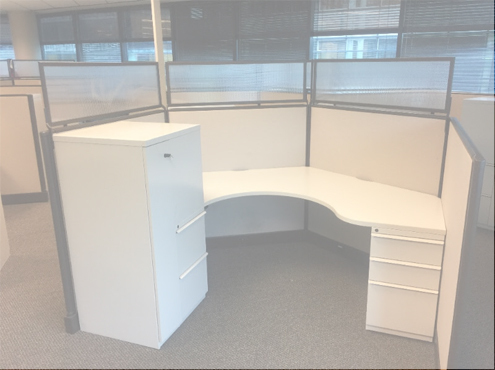 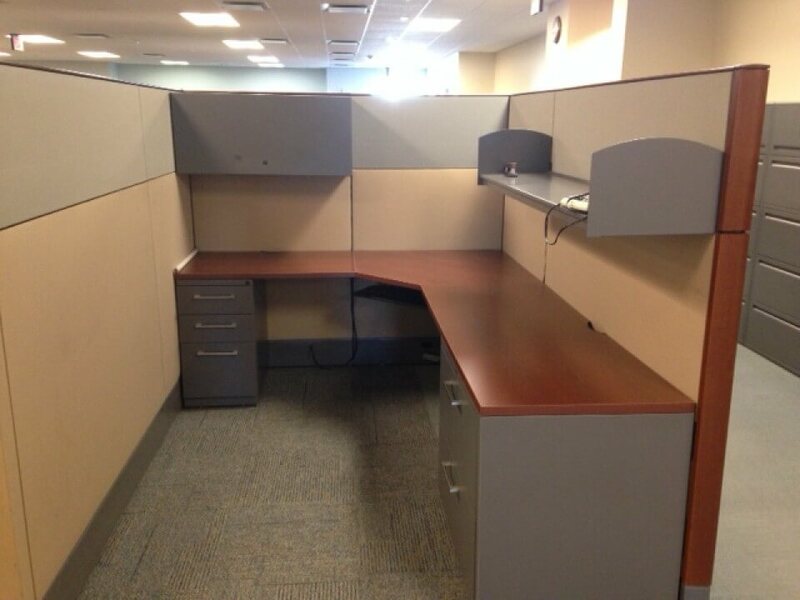 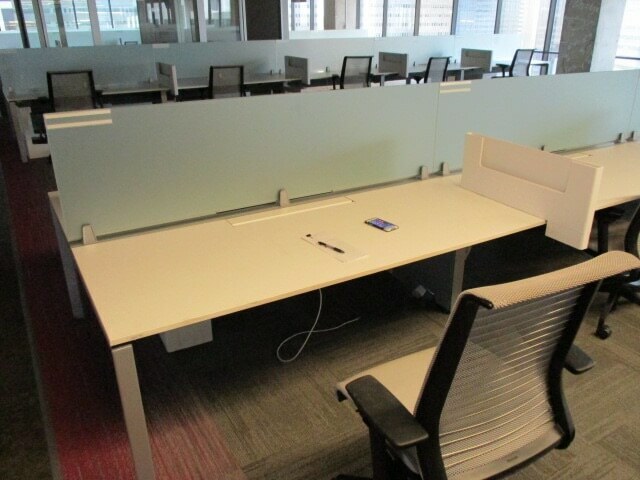 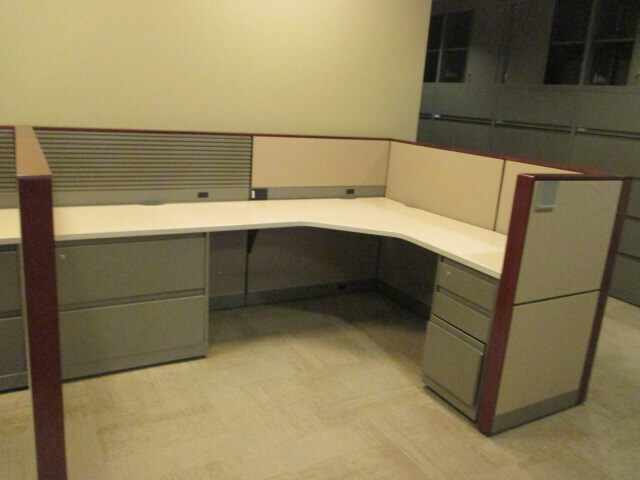 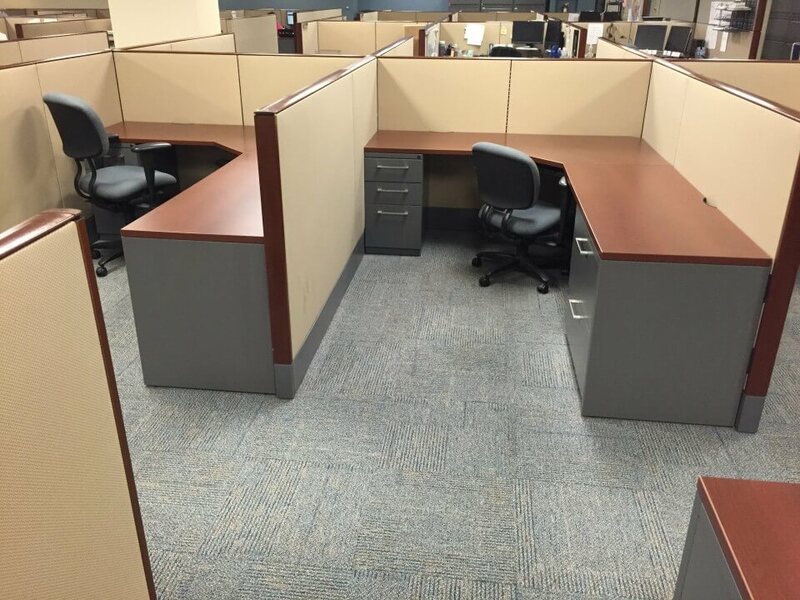 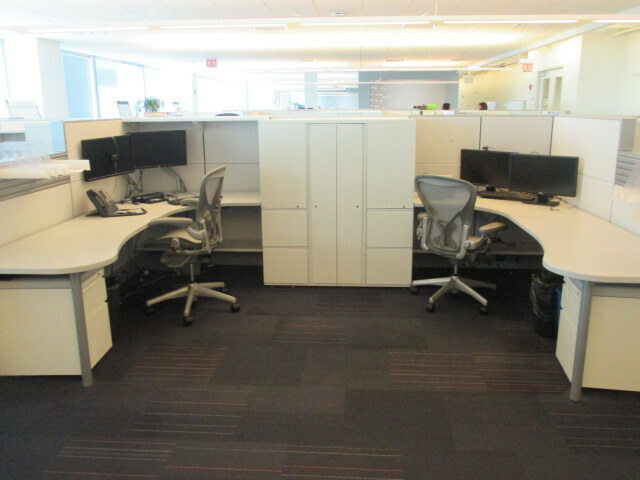 While the quality of used office cubicles can approach that of brand new or barely used, brand new is still brand new. 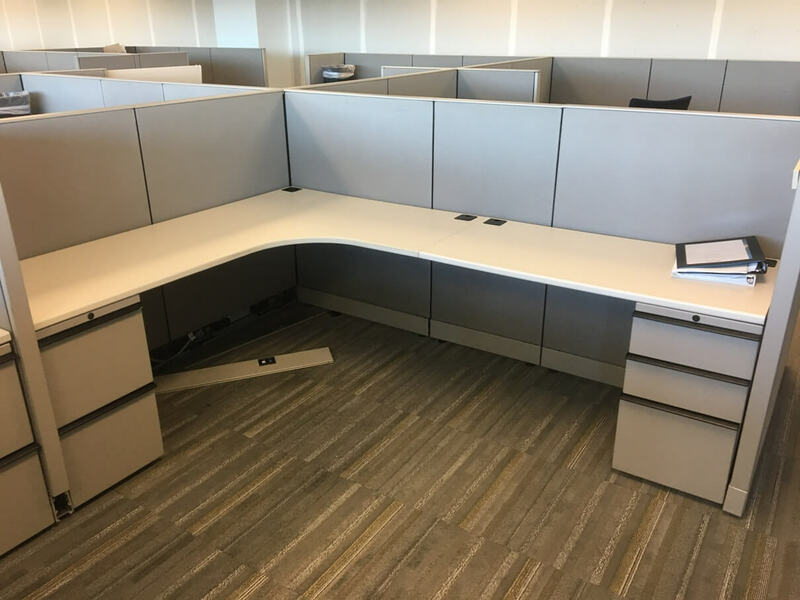 Items from office furniture liquidation may have some nicks and scratches, and it may no longer have that “new car smell”, but on the bright side, many untrained eyes will have trouble telling the difference. 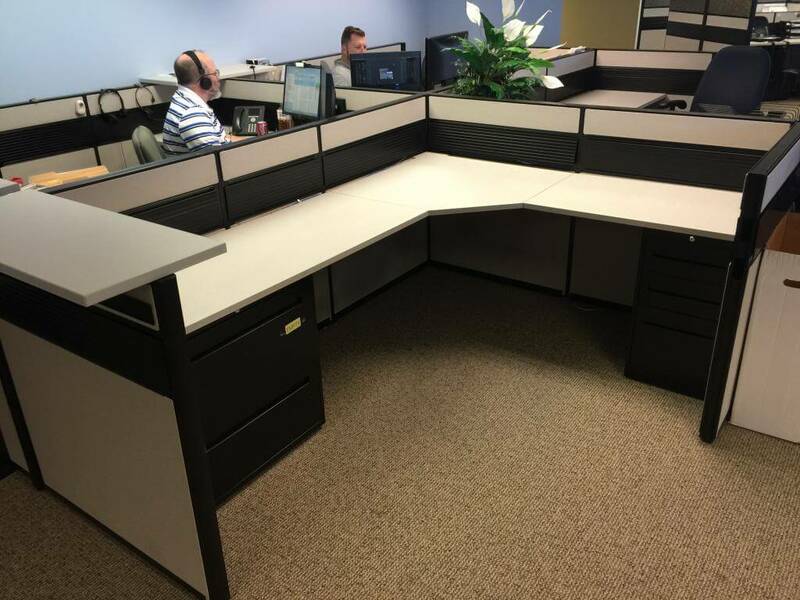 Any office systems furniture dealer worth their salt (like us!) 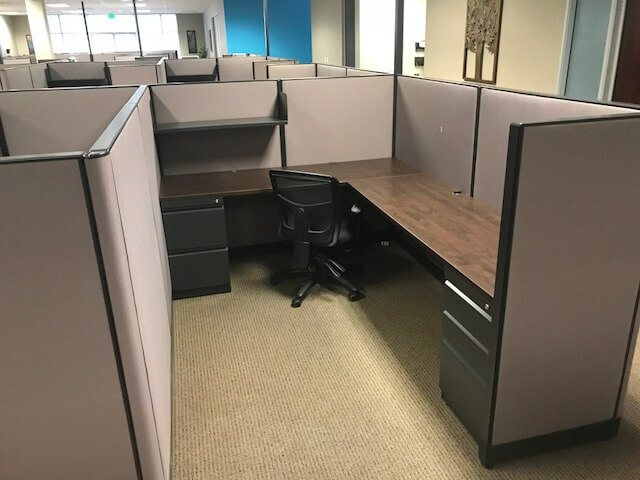 will be proactive about after-sales service whether they have sold you new or used office furniture, but warranties on as-is, pre owned furniture will typically be limited in scope and duration compared to those for brand new cubicles. 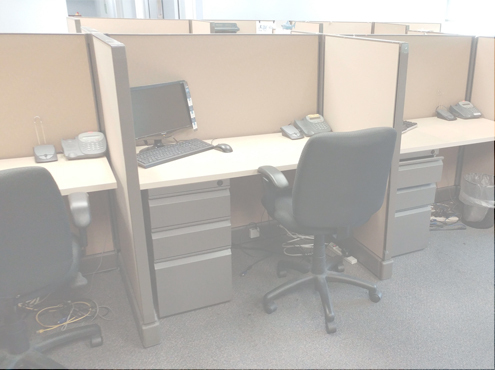 Buyers must find a used office furniture inventory that will match or adapt easily to their desired configuration. 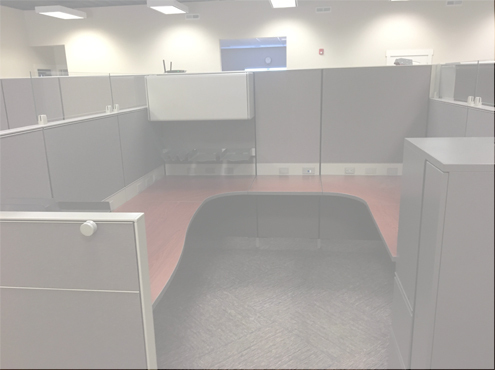 Buyers of new cubicles can simply order a custom layout however they wish, as these parts are manufactured to their specifications. 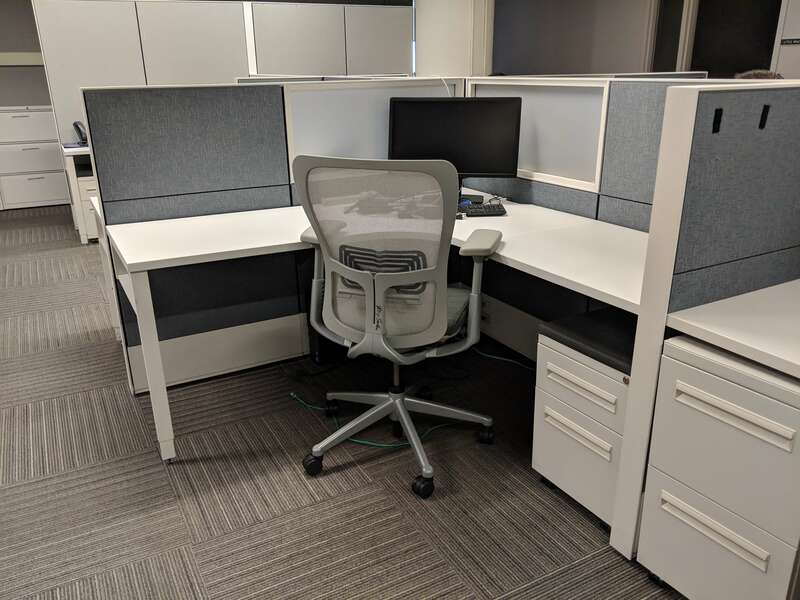 But used inventories have a predetermined list of panels, connectors, desktops, and components in specific sizes that can only be put back together in so many ways. 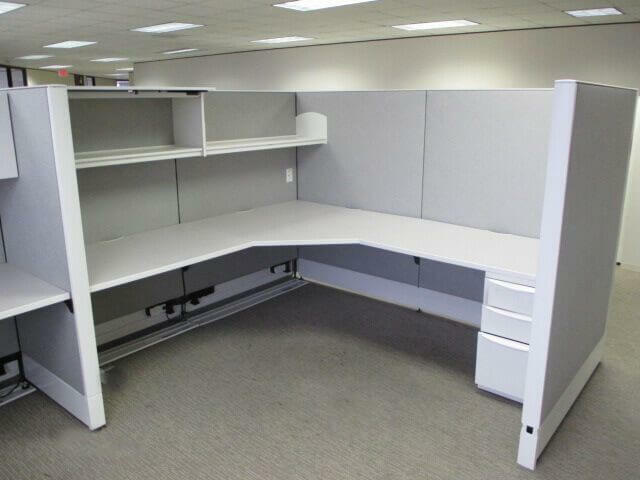 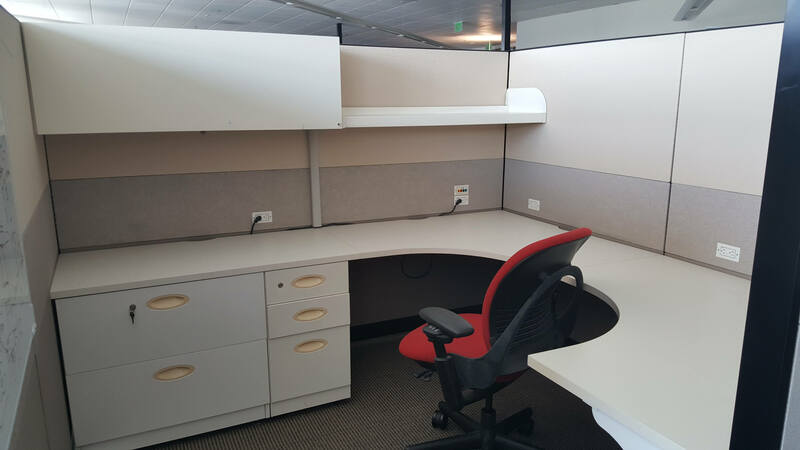 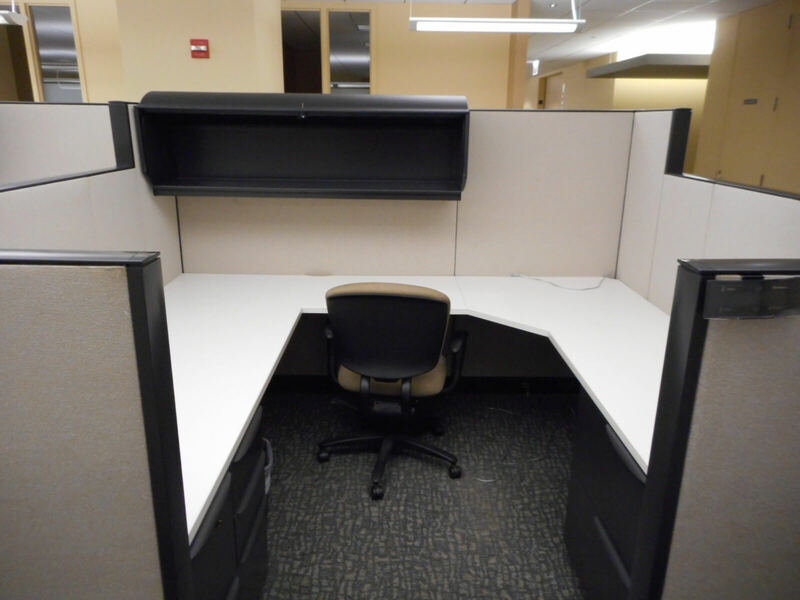 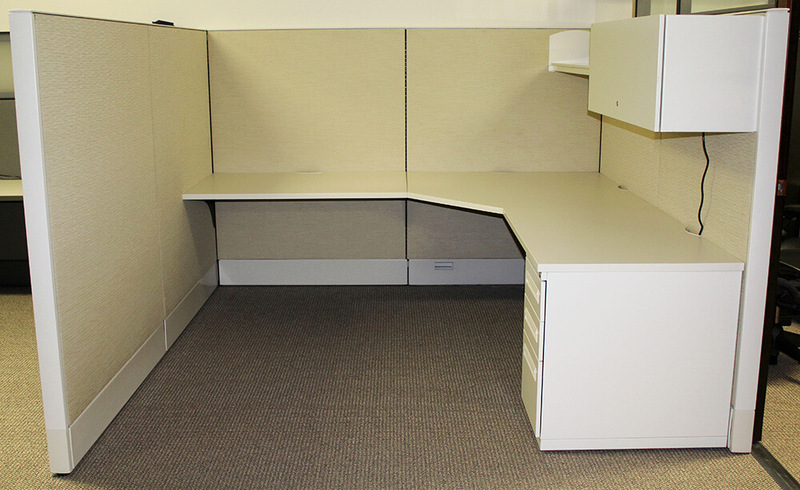 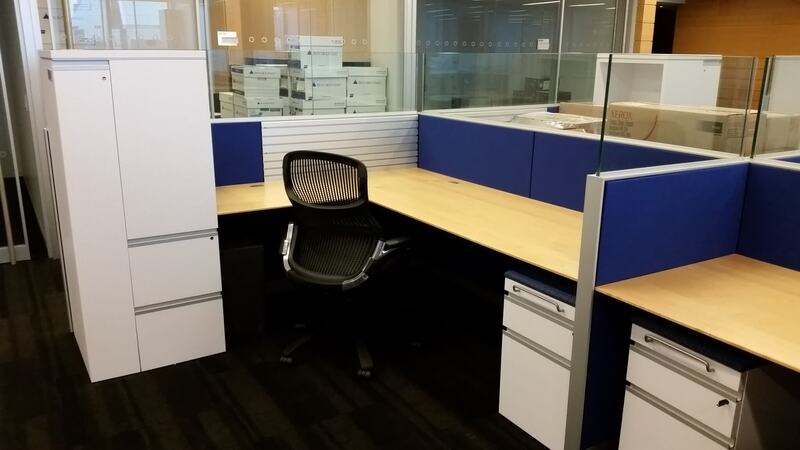 Curious to know more about the differences between new, used, and refurbished office cubicles? 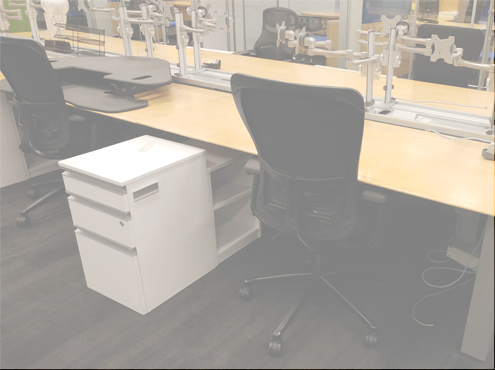 Download our free white paper here: Something Old, Something New, Something Green – How to Choose Between Brand New, Clones, Newly Remanufactured, Refurbished/Used, or New Alternatives.